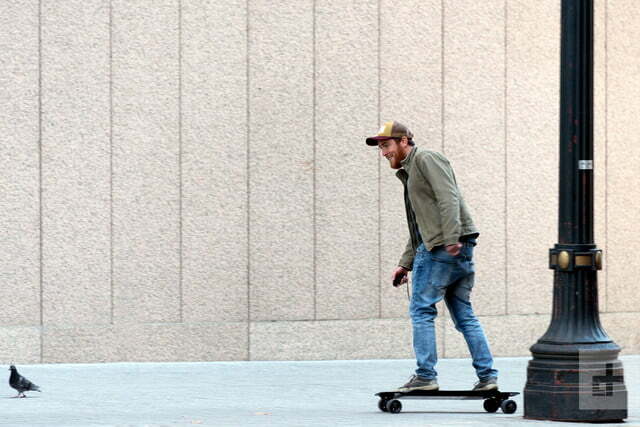 You’ll be hard-pressed to find a board that’s smoother, stealthier, and more stylish than this one. 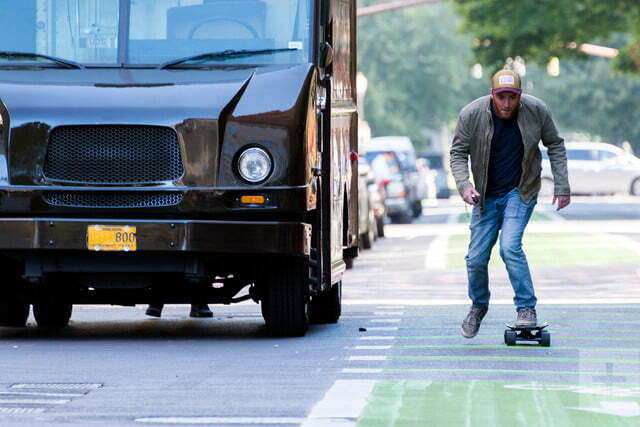 Over the past few years, electric skateboards have evolved from a niche novelty to a practical – and popular – way to get around. 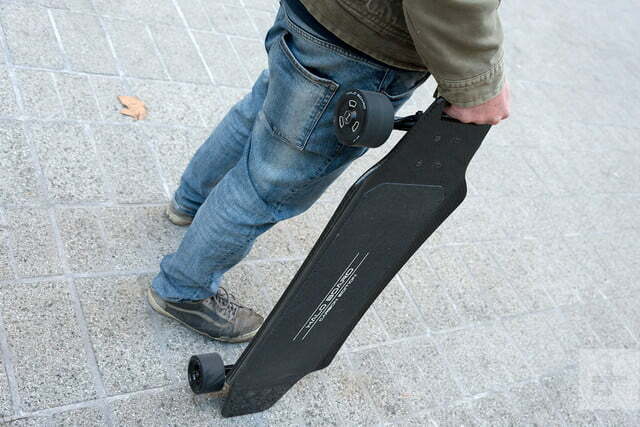 Today, there are hundreds of different electronic boards to choose from, and as such, manufacturers have been developing increasingly sophisticated skateboards in an effort to distinguish themselves from competitors. Case in point? 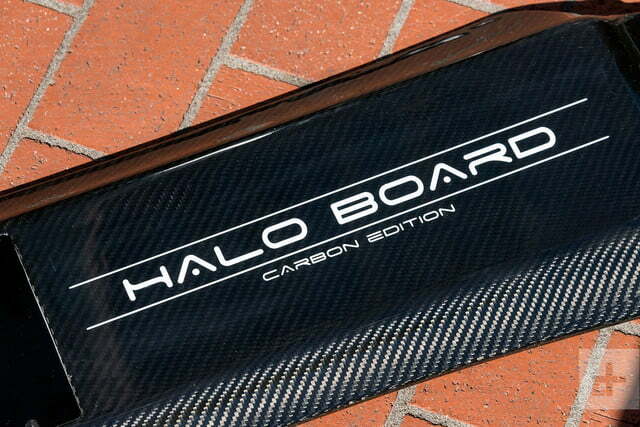 The Halo Board Carbon Edition. It’s arguably one of the most advanced electronic longboards on the market right now, and boasts just about every bell and whistle you could hope for. We got our hands on one for review and took it for a ride. In terms of specs and features, there are a few things that make this board stand out from the rest of the pack. 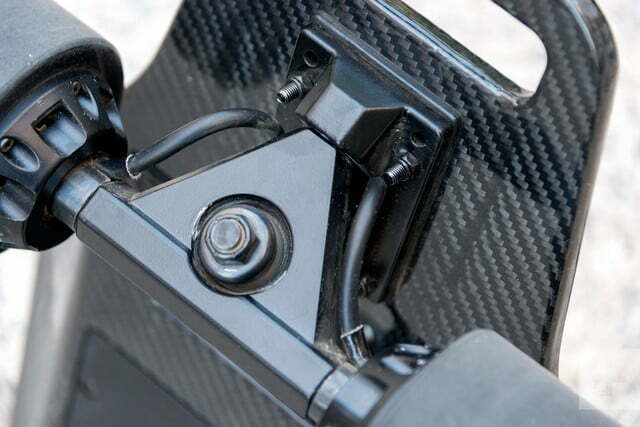 The first and most obvious is its carbon-fiber construction, which presumably makes it lighter and more durable than its wooden counterparts. 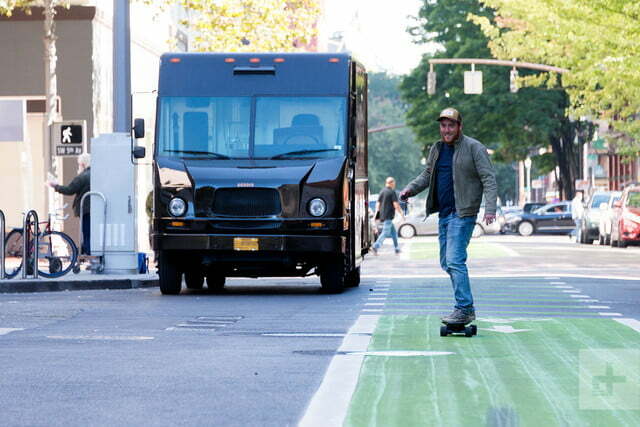 Second, it boasts a pair of beefy 1,500-watt hub motors that allow it to hit a top speed of 22 miles per hour, and allegedly travel up to 14 miles on a single charge. That’s not too shabby — but specs only tell you half the tale, so to get a better idea of how the Carbon Edition performs in the real world, we rode it. A lot. Probably over 50 miles at this point, in fact. In the process, we took it through just about every kind of terrain imaginable, in a wide variety of different weather conditions. Here’s what we liked and disliked about it. 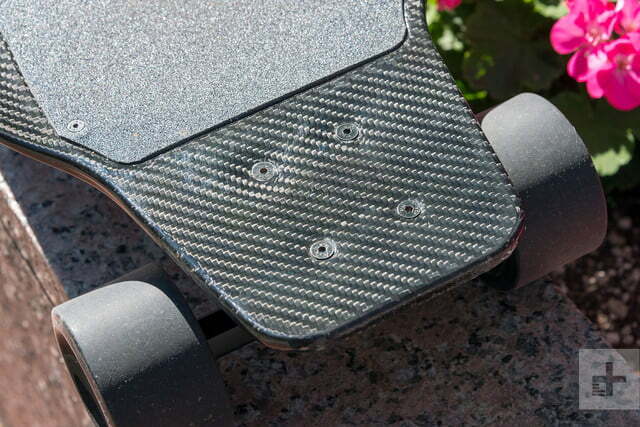 First thing’s first: The carbon fiber deck is both a blessing and a curse — although we’ll admit the blessings outnumber the curses in this case. Carbon fiber is not only lighter and more durable than wood, it allowed Halo Board’s designers to integrate the battery directly into the deck, rather than attaching it to the underside, as you typically find on most electric boards. This gives the board a nice, sleek underbelly with lots of clearance, so it doesn’t really look like an electric board. It also distributes the board’s battery weight across the full length of the deck, rather than tacking it awkwardly onto one end. 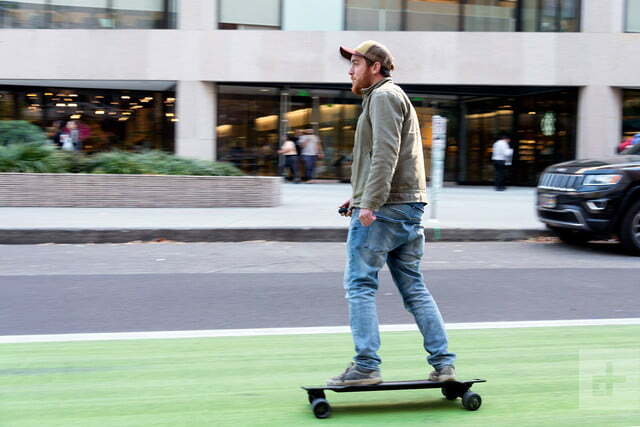 This ultimately makes the board more balanced, and therefore less cumbersome to carry around when you’re not riding — which is a pretty big deal if you use the Halo Board as a commuting vehicle. The downsides? The deck is extremely stiff, its battery can’t be swapped out when you run out of juice, and the parts without grip tape get super slippery when wet. Like we said though — these minor flaws are outweighed by the aforementioned virtues, and there’s a whole lot more to this board than just the deck. 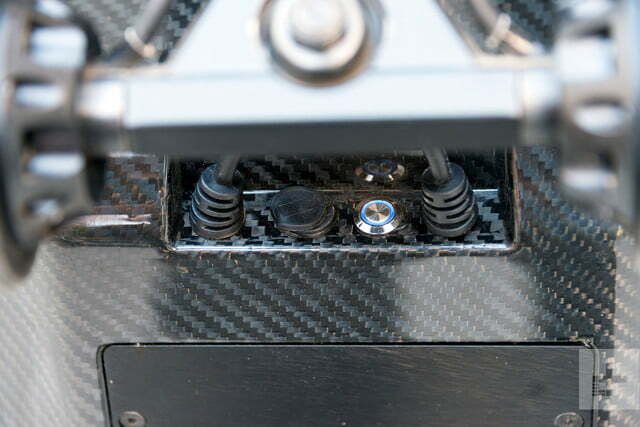 Without a doubt, the Halo Board’s biggest assets are a pair of beefy, 1,500-Watt hub motors. This certainly isn’t the first board we’ve ridden that has hub motors instead of belt-driven wheels — but it’s definitely one of the best for one simple reason: rolling resistance, or lack thereof. 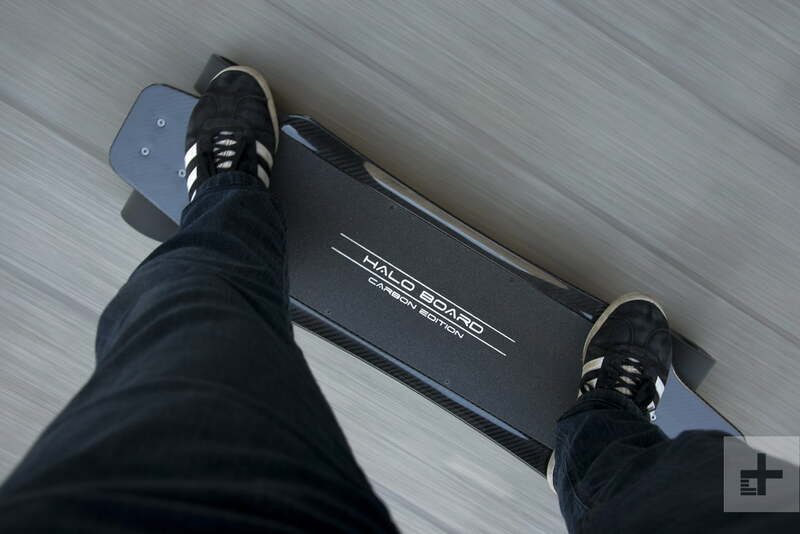 The Halo Board has exceptionally smooth and free-rolling motors, which makes a massive difference in terms of how it feels under your feet. 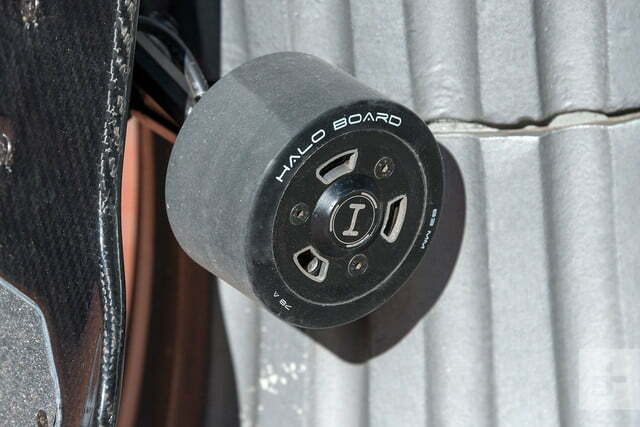 The Halo Board is arguably one of the smoothest longboards we’ve ever ridden. 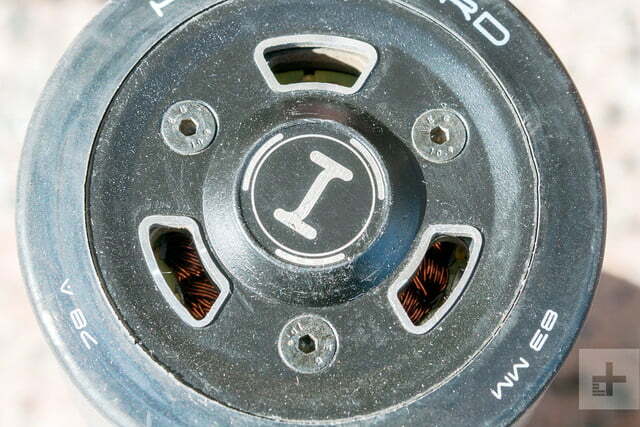 See, not all hub motors are created equal. Some don’t spin freely when they’re unpowered, which makes it feel like you’re braking when you let off the throttle, rather than coasting. And when your battery runs out, you’re not going far. Many cheaper electric longboards suffer this “sticky wheel” effect, but the Halo Board is arguably one of the smoothest we’ve ever ridden. When you let off the throttle, there’s almost zero jarring, and the board is relatively easy to push when it’s dead. You probably won’t be pushing it around dead too much, but it’s still nice to know that you can if you need to. These motors are also whisper quiet during acceleration — which is practically unheard of (pun thoroughly intended) in electric skateboards. On just about every other board we’ve ever tried, acceleration is accompanied by an annoying electric whine, which increases in pitch as the RPMs climb. You can still hear the Halo Board, but its volume is orders of magnitude lower. 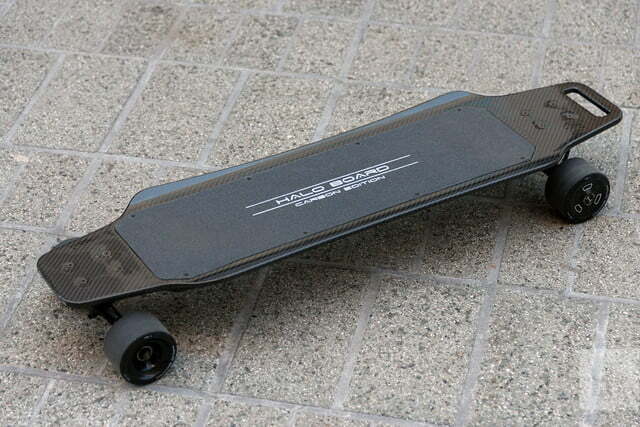 At low speeds, it’s almost silent — which only compliments the board’s stealthy, jet-black appearance. Another thing we enjoyed about this board is the fact that it has pretty decent brakes — and that’s a bigger deal than you might think. Even if you know how to footbrake or slide effectively, it’s still pretty convenient to have a nice set of smooth, predictable brakes at your disposal. To activate them, you simply pull back on the joystick controller. 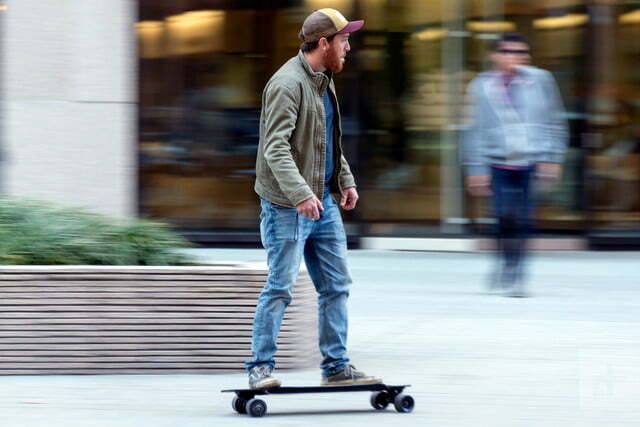 You’ll feel a little bit of a forward lurch as the board slows down — especially if your stance isn’t good — but generally speaking the Halo Board’s brakes are far less jarring and sudden than a lot of other electronic boards on the market right now. 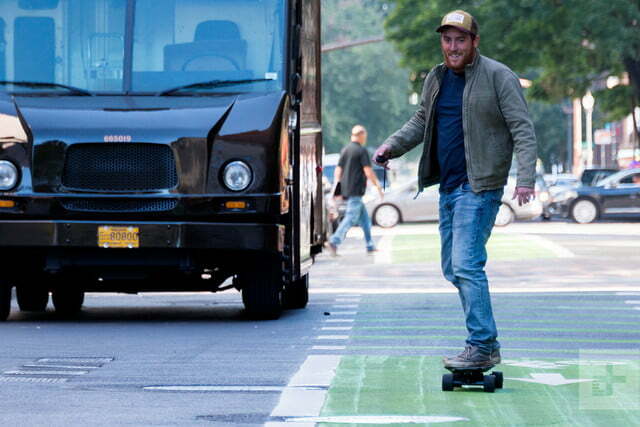 Braking also regenerates the batteries a small amount, which extends the board’s range on hilly journeys. Really, the only major downside to this board is the flimsy, unpredictable controller it comes with. Our first one actually arrived broken, and the replacement we got feels like it wouldn’t survive a hard smack onto the pavement — which would likely happen if you took a spill and used your hands to break your fall. On top of that, the controls are a bit touchy. If you don’t maintain perfectly consistent pressure on the joystick, the motors will sometimes switch off, which often creates a feeling that board has “died” mid-ride. To resume your former rate of acceleration, you have to let off the stick and then gingerly inch your way back up to where you were before — and if you’re not careful, you can easily over-accelerate and lose your balance. That said, this quirk is fairly easy to acclimate to, and after a couple hours of riding, you’ll get a feel for how the accelerator behaves. Just like anything else, there’s a bit of a learning curve. 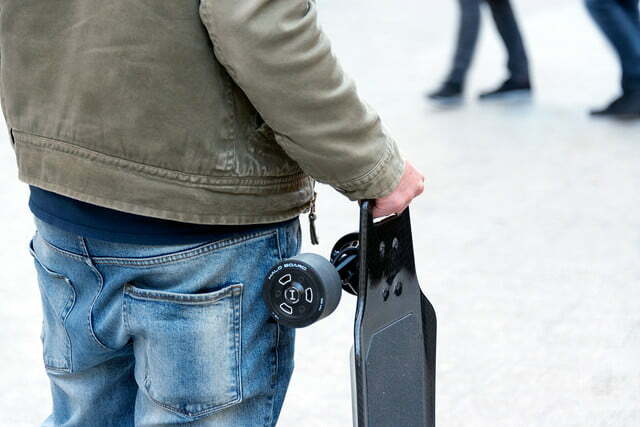 Sure, it’s a bit stiff and the controls take a minute to get used to — but between its powerful motors, excellent coasting, and sleek, easy-to-carry design; the Halo Board easily makes up for its shortcomings. 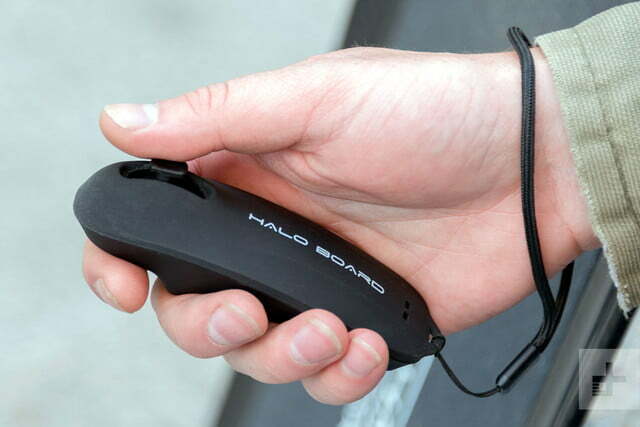 So while there’s certainly room for improvement here, the Halo Board Carbon Edition is arguably one of the best electric skateboards we’ve tested thus far, and is absolutely worth considering if you’re in the market for a rideable.